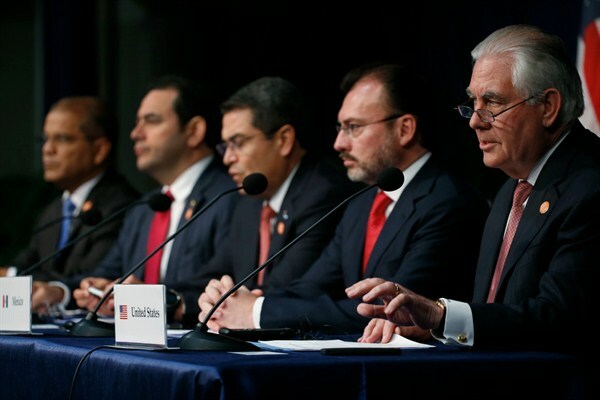 U.S. Secretary of State Rex Tillerson with officials from Mexico, Honduras and El Salvador during the Conference on Prosperity and Security in Central America, Miami, June 15, 2017 (AP photo by Wilfredo Lee). Over two days in Miami earlier this month, the leaders of Honduras, Guatemala and El Salvador met with officials from the United States and Mexico to discuss the longstanding challenges of combating transnational crime, narcotrafficking and corruption in Central America. Any discussion of migration policy, however, was explicitly off the table at the Conference on Prosperity and Security, which included U.S. Vice President Mike Pence, Secretary of State Rex Tillerson and Homeland Security Secretary John Kelly. Despite brutal conditions in the region that have driven a spike in migration north in recent years, the Trump administration’s narrow priorities in Central America became clear in Miami, if they weren’t already.